The idea behind Chiropractic is really quite simple. Our brain controls our entire body with constant messages. It tells our heart when to beat, our lungs when to breath, and our feet when to walk. The way it does this is through the nervous system. 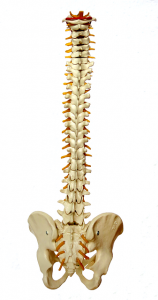 Our spinal cord is what carries these messages down the spinal column. Between each of our vertebrae in our backs, there are small holes where nerves leave the spinal cord and travel to the body. If one of our vertebrae moves out of its original alignment with the others, it will cause one of these existing nerves to be pinched. When this occurs, and nerve messages can’t flow like they should, we call it a “subluxation”. A subluxation is a lot like a kink in a water hose. Normally, water is allowed to pass freely through the hose, much like messages from our spinal column to our bodies. But if we have a kink in the hose, or a subluxation, water and the brains messages aren’t allowed to flow like they should.